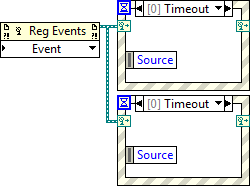 It is generally considered bad practice to wire an event registration refnum wire to multiple event structures. This test is saved in LabVIEW 2013. Follow the instructions here to install and use this test. "It is generally considered bad practice to wire an event registration refnum wire to multiple event structures"
Minor correction: it is unequivocably a terrible idea to bind this registration simultaneously to multiple Event Handler Structure. Though, it's possible to unbind from one Handler and rebind with another, so long as no time overlaps where both handlers are bound to the same registration. In that repo, 04 - Demonstration - Effect of Branching Event Registration.vi and 03 - Demonstration - Dynamically Rebind Event Handlers.vi demonstrate these two principles. Jack, this is a _fantAstic_ demo.